Tiger Lilly the Plott Hound at 9 months old—"I acquired her from a friend who had her sister. The picture attached is what I walked out of my shower to one morning. 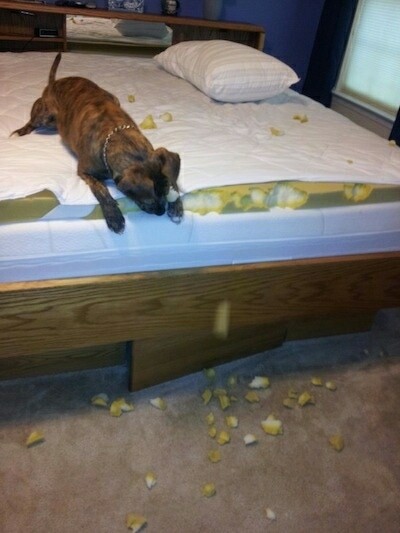 She had chewed the mattress topper everywhere it was exposed! I should have been tipped off when she came into the bathroom for a drink of water. Fortunately, it was the topper, not the mattress itself!" Spencer the Pitbull busted on the cat cam! Watch as he steals the cat's breakfast right off the table! Blueberry the Shih-Tzu mix at 1 year old—"We adopted Blueberry from our son. He named him Blueberry because of the small spots on his legs. We live on Blueberry Island so I guess it was meant to be. The photos are of a hood I made so he would not lick after he was neutered. He really had to work to get it off and the photo below reflects how he felt about it." Blueberry the Shih-Tzu mix at 1 year old with his homemade hoody. The hoody after Blueberry the Shih-Tzu mix decided he didn't want it on his head anymore. He worked hard at getting it off and then had some fun with it. "This is my little Chopper dog. We got him at the pound. He was a fat little guy—later found out he had worms really bad. We took care of that right away! Chopper moved in with my husband and me. He never chewed clothing, shoes or furniture. He was almost immediately housebroken and he has trained us very well." "I had to go out of town for seven days. Just before leaving I made sure I had all the bills paid and all the mail and other paperwork put away. The evening when I didn't come home, Chopper chewed up every piece of paper I touched that day just before going to the airport." "Then the next day he decided he didn't like the white picket fence around my flower bed either. We found out he was partBasenji when one of the porters at the airport came running up to us yelling "a Basenji, a Basenji!" He has a mind of his own even though he knows all the commands and even knows some American Sign Language." Wingnut the Smooth Fox Terrier mix CAUGHT jumping the fence. Cafi the German Shepherd/Golden Retriever mix (Golden Shepherd) shred a roll of toilet paper all over the living room. I think the cats helped a little on this one but were not to be found when I walked in the room. Cafi decided that she needed a little snack and found the cup in the trash from her owner’s shake. Shih-Poos—Charlie and Ginger CAUGHT getting into a box of tissues. "Charlie (white) and Ginger (apricot), they are littermates. They are approximately four months old in this picture. They are too cute. Messy little buggers though." This is Lily the Maltipoo, who raided the trash for barbecued ribs. Also the sock that she had dragged out of the dirty-clothes hamper can be seen in the far upper left hand corner of the picture!